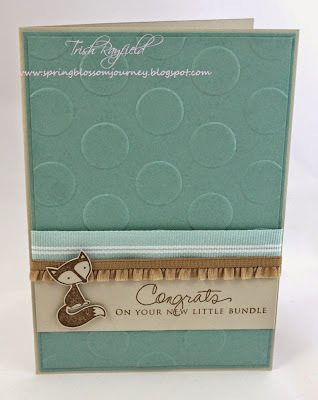 Well last week was the StampinUp!Convention and while I didn't attend I did go to the coast to catch up with all the Just Add Ink design team who were there. It was lovely to see them all as it's been two years since I've seen them all in person. So for this week's challenge at Just Add Ink I trawled pinterest and found this lovely image with such soft colours. I've chosen to use these colours in the baby card I created! 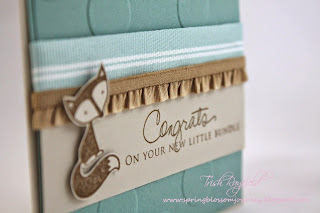 I don't know why but when I was making this card I decided it needed a little brown fox - he's just so cute!! I hope you all have some time to play along and share your creation with us here. It was SO totally awesome spending time with you (a whole week would have been the best) and the little guy again! He's growing so quickly and you're looking gorgeous and totally rocking motherhood! This card is just too cute Trish! Love that little fox and the embossed spotted background. Such a cute card Trish! Love it! That fox is a little bit cute! Beautiful baby card!